I’ve seen lots of Fringe shows that I haven’t told you about yet, but the one I want to be sure to mention before it closes is the one that I am too close to to review. This was my first year being involved with a Fringe production. 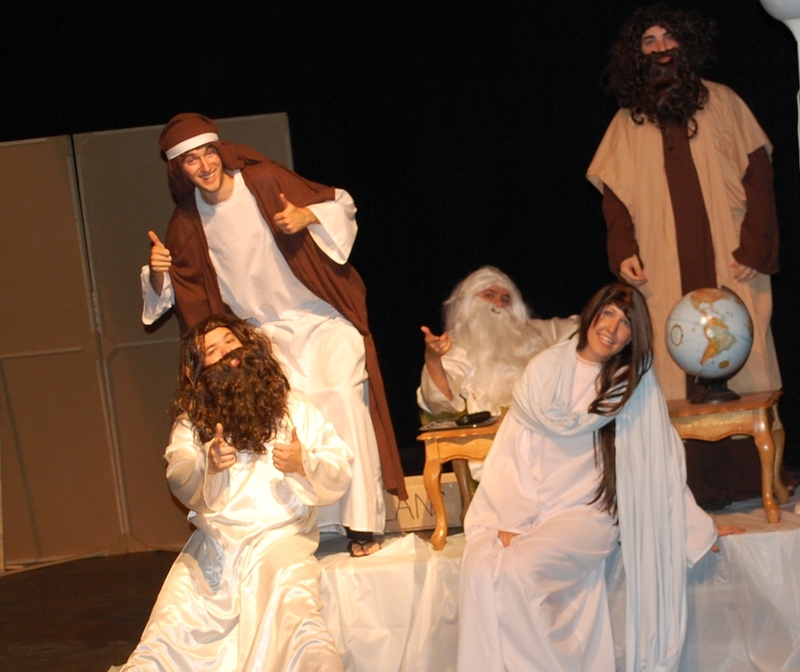 I’ve been stage managing an original comedy called God on God, written by Dan Moser and Jordan Ward, and performed by Moser, Ward, Kay Schultz, Nate Collins, and Colby Crossley. It’s been fascinating, educational, and a lot more fun than I expected to help the show come together, tinker with details to make it run smoothly and on time, and watch people laugh from my seat in the booth beside our quiet organized sound and light tech Joey Roach. We’ve been running at Venue 51. Didn’t know there was a Venue 51? It’s the Avenue Theatre, on 118 Avenue (Alberta Ave), between 90 and 91 Streets. And while it would be fun to be closer to the main Fringe site in Old Strathcona and we’d almost certainly get more drop-in playgoers, it’s also been neat to be part of expanding the Fringe to a different part of Edmonton, and handy to have free convenient parking and little traffic nearby. We’re the only show in the venue, which means that we’ve been able to stay set up between shows, which makes my job much easier. Our last show is tonight at 8 pm. Tickets will be available at the door unless we sell out ($12 cash only) as well as through the Fringe box office and yeglive.ca. Our advertised running time is 50 minutes, so if you want to get to the volunteer wrap party afterwards or just get into bed early before going back to work on the post-Fringe Monday, you should still be able to fit us in. I’ve watched it 13 times, and it still makes me giggle. I try to do it quietly, but you don’t have to. Finish your Fringe with God on God! This entry was posted in Festivals, Theatre and tagged colby crossley, dan moser, fringe, god on god, jordan ward, kay schultz, nathain collins on August 25, 2013 by Ephemeral Pleasures.